We built the House of Trestles as a home for surfers and backpackers, making their pilgrimage to surf Trestles. The project consists of five Team Rooms, designed by local surf companies, including Lost Surf Boards, Rainbow Sandals, Ripcurl, Vissla & Catch Surf. 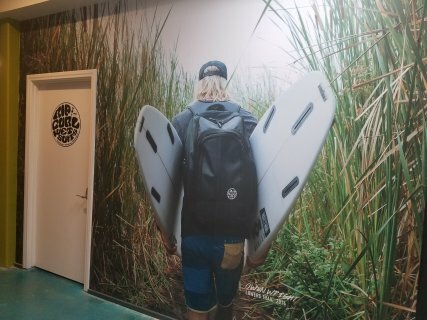 When not used by the surf companies the Team Rooms are open to the public and provide a unique connection to the surf industry and their team riders. We handcrafted the semi to private, birch bunk beds with a curtain system for additional privacy. Each bunk has a memory foam mattress, reading light, USB charging dock and lockable storage. Each room has a sink, windows and air conditioning. The common areas include a kitchen, dining hall, Moroccan lounge (Cuddle Puddle), laundry room, restrooms, showers, surf shower, wetsuit rack and art gallery. Play an instrument? We have a jam area with piano, drums and a guitar in the Cuddle Puddle. Want a relaxing night? Grab a book from the library or lounge and watch the latest surf flicks. We have a quiver of Lost Surfboards and full lineup of Ripcurl wetsuits so you can demo the latest gear. We also have bikes with surf racks so you can hit all 16 surf breaks in San Clemente. 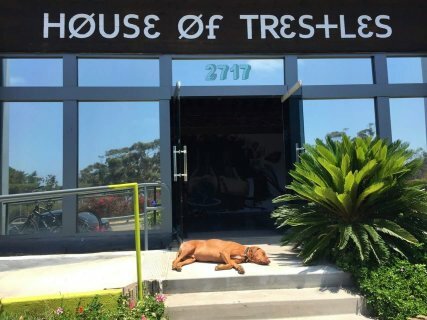 House of Trestles is a surf house, steeped in San Clemente Surf Culture and Street Art. Located on Surfer’s Row, you will be within walking or bike riding distance to 16 local breaks, including world famous Trestles. If guests require a late check-in (past 8pm PST) a $5 charge applies. The Lost Surfboard Team Room, at the House of Trestles, stays true to the heart of Lost. It was designed as a replication of the Lost factory in the Surf Ghetto. Its walls are covered in stickers, notes, numbers and items from the factory. The room has two bunk beds fashioned by a local wood to smith with memory foam mattresses for comfort. The bed is designed semi to private with a curtain system for full to privacy. Each bed has a reading light with multiple USB chargers to insure your are ready to rock in the morning. The room has a sink with counters and a min to fridge for goods. 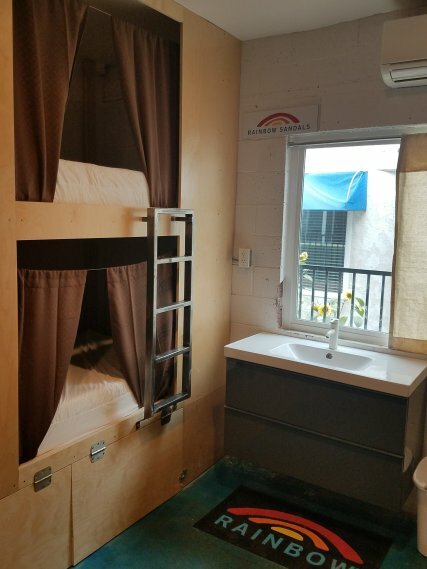 Each bunk has an XL, lockable storage locker. Rainbows are a deep part of San Clemente surf culture and makes the best sandals in the world. The room has four birch bunk beds (8 beds) made by a local wood to smith, with a memory foam mattress for comfort. The bed is designed semi to private with a curtain system for full to privacy. Each bed has a reading light with multiple USB chargers to insure your are ready to rock in the morning. In 1981 Ripcurl made San Clemente its official US home. Since then Trestles has served as its go to to, wetsuit research and development hub. The room has two birch bunk beds (4 beds) made by a local wood to smith, with a memory foam mattress for comfort. The beds are built semi to private, with a curtain system for additional privacy. Each bed has a reading light with multiple USB chargers so you can power up. Each bed comes with an XL, lockable storage locker and extra storage around the room. There is a sink, with drawers for toiletries, a large window and air conditioning. 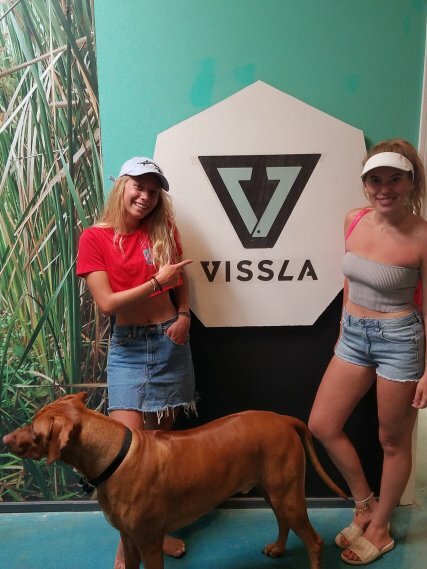 Vissla personifies van to life; surf anything, ride everything mentality. There is an oversized sink/counter, with drawers for toiletries, a large window and air conditioning. The Catch Surf Team room is as wild as the brand, with a large vinyl wrap of Johnny Redmond of San Clemente Fame presenting three beauties on the SC pier. The room has three birch bunk beds (6 beds) made by a local wood to smith, with a memory foam mattress for comfort. Each lesson is 1hr 30mins and includes equipment. Josh is a champion for the live to work to play revolution. Creating mixed to use spaces that enhance quality of life. House of Trestles is a passion project to share his hometown with international surfers and backpackers in a communal setting.